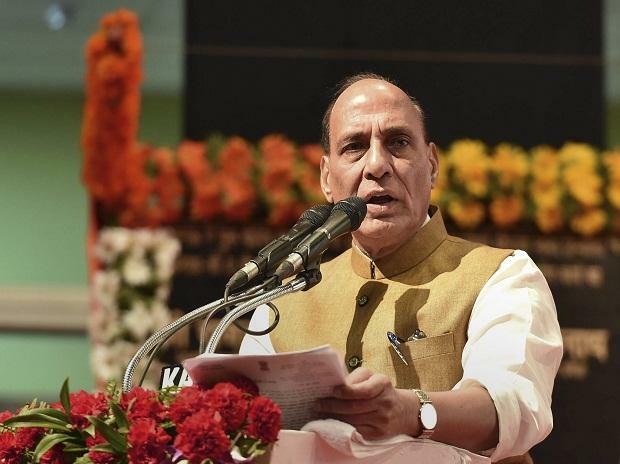 The government will review the security of the people working at the behest of Pakistan and its intelligence agency ISI, Union Home Minister Rajnath Singh said here on Friday, in an apparent reference to separatist leaders, in the wake of the deadliest attack on security forces in Kashmir that left 40 CRPF personnel dead. After chairing a high-level security review meeting, the home minister said it has been decided that no civilian traffic will be allowed during the movement of security forces' convoys. In a veiled reference to separatists, including Hurriyat Conference leaders, Singh said the security given to people getting funds from Pakistan and its ISI should be reviewed. "There are elements and forces who take money from Pakistan and the ISI. I have asked the officials concerned to review their security," Singh told reporters at the end of his day-long visit to Kashmir. The home minister said some elements in Jammu and Kashmir had links with the ISI and terrorist organisation, but the government would defeat their designs. "Such people are playing with the people of Jammu and Kashmir and the future of the state's youth. Our war against terror is in a decisive phase and I want to assure the nation that we will win it," he said. The home minister, who arrived here following the worst terror attack on security forces in the state in the past three decades, also visited the injured jawans undergoing treatment at a hospital. Singh said it was decided that the civilian traffic movement will be halted temporarily when big convoys of security forces are on the move. "This may cause inconvenience and I apologise for this but this is necessary for safety of jawans," he said. Singh said he has issued necessary instructions to the security agencies in the wake of the suicide terror attack on the CRPF convoy. "The morale of the security forces is high," he said. He said the Centre and the state governments were with the bereaved families of the CRPF personnel killed in the attack. "I have asked all the state governments to provide maximum help to the bereaved families," he said. Asked if the attack was a result of security lapse, Singh said the incident is being investigated. On the violence that erupted in Jammu on Friday, the home minister said he has asked the state administration to deal with full force with those elements trying to disturb communal harmony and peace. Prime Minister Narendra Modi on Friday said those responsible for the attack will pay "a very heavy price" and security forces will be given a free hand to deal with terrorists. In a hard-hitting speech, Modi said the "blood of the people is boiling" and forces behind the act of terrorism will be definitely punished.